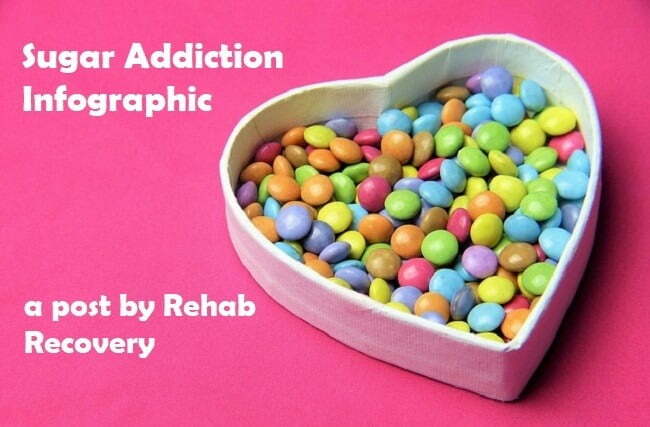 In this post, we share an interesting infographic about sugar addiction. If you are a long-term sugar eater, then you will be all too familiar with those mid-afternoon sugar cravings. Although you know you will regret eating so much sugar after the event, you go ahead and do it anyway. If you are dieting, then you probably know how frustrating sugar cravings can be in getting in the way of your progress on the weighing scales. We consume sugar for the same reason people consume alcohol and drugs – it makes you feel better. If you are stressed or if you are down in any way, sugar offers a means of self-medicating away these negative feelings. This is one reason why sugar addiction is a negative coping strategy. In all reality, there are far better ways to cope with negative emotions that do not involve sugar consumption. Learning about these healthier alternatives requires research and planning, but the time spent undertaking this research is well worth the effort. Excessive sugar consumption is linked to many grave health issues such as obesity, heart failure, high blood pressure, diabetes and high cholesterol. It’s peculiar that despite these serious health complications linked to sugar consumption, not many people really pay any attention to them at all. For instance, it’s likely millions upon millions of people choose not to smoke cigarettes because of the risks of developing cancer. However, this level of caution is rarely exercised when it comes to avoiding a bar of chocolate or fizzy drinks. Sugar is addictive because it stimulates the pleasure centre within the brain. When the pleasure centre is stimulated, dopamine is released. Dopamine is also linked to the expectation of pleasure and this is one reason why you will be so pre-occupied with the thought of eating sugar. When dopamine levels are not satisfied, you will begin to experience negative psychological withdrawal symptoms such as anxiety and fatigue. White sugar is clearly the main culprit when it comes to global sugar addiction. Once you stop eating white sugar for around a week, sugar cravings will naturally retreat. One reason why the body loves white sugar so much is that white sugar is quickly transformed into glucose. Glucose is the primary source of energy for major organs such as the brain, liver and muscles. If you instead eat berries and whole wheat, sugars contained in these foods are buried within proteins and fibre, meaning the body will take longer to access these sugars to convert them into glucose. If you are sugar dependant, you will feel a range of psychological withdrawal symptoms when you begin your sugar-free existence. You will feel irritable and restless. It’s important to eat alternative foods such as whole wheat and berries to ease these withdrawal symptoms to manageable levels. If you do not replace white sugar with an alternative, it’s likely you will eventually give in and relapse in order to release yourself from the agony of sugar withdrawal symptoms. When you stop eating white sugar, the body’s sugar levels will crash. Also, your sugar addiction means your cell receptors that register sweetness expect a regular sugar hit. When this sugar hit is withdrawn, your body will rebel causing you to experience sugar cravings. That’s why it is important to replace sugar with natural alternatives such as berries, whole wheat bread and honey. 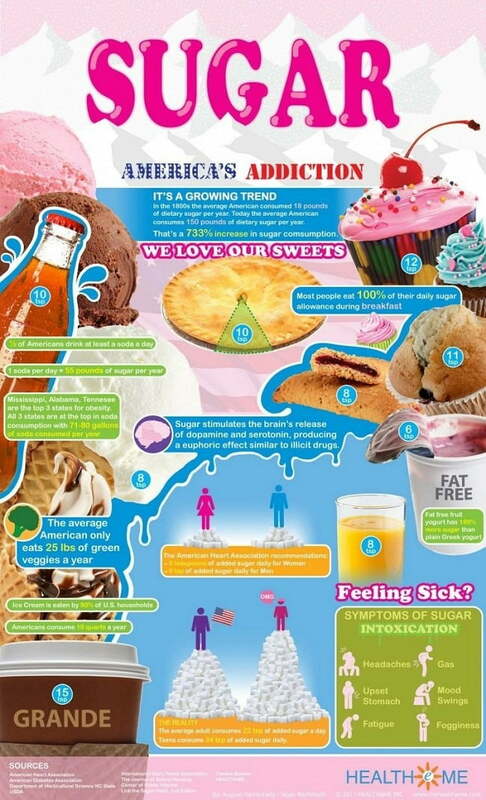 The below infographic shares a number of interesting facts about America’s sugar addiction. Although the infographic focuses on US statistics, these facts could equally apply to other English-speaking countries such as the UK, Canada, Australia and New Zealand.